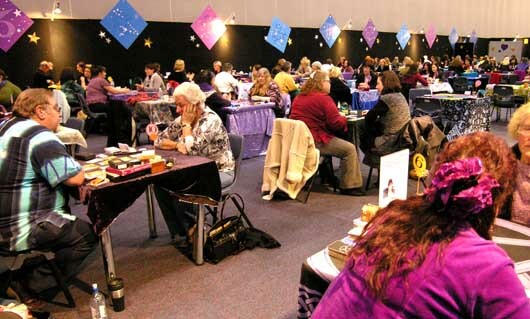 With more than 200 exhibitors honing their psychic, spiritual and therapeutic skills, Australia’s annual Mind Body Spirit Festival is sure to strike accord with even the most sceptic of people. From meditation, yoga, organic health, inspirational seminars, body pampering, psychic readings, spiritual healing and life coaching – there’s something for everyone at Australia’s largest, most popular health, wellbeing and natural therapies event. From the moment you enter Sydney Exhibition Centre’s foyer doors, you know you’re in for something special. With meditation classes run every 30 minutes, you’ll forget you’re in one of Sydney’s largest convention centres. See, you wouldn’t get that at your average festival, would you? But, it doesn’t stop there; walk to the back of the expo and you’ll see a designated psychic reading area with over 50 psychics vying to get down and dirty. And by that, I obviously meant predicting your future. Jeez, what did you think I meant? Anyway, this part of the festival is generally the most talked about, and is often the centre of attention in exhibitions of this size. And this year, it didn’t disappoint. It’s become common knowledge that these sessions are usually sold out by say, midday. This means you must book an appointment as soon as it opens. Yes, 10am on the dot. As a ‘tarot-card virgin’, I had no idea what to expect. Of course I’d seen those trashy reality shows with the clairvoyants and mediums who channel spirits and ghosts which suspiciously look like those video filters on Final Cut Pro, but yeah, that obviously doesn’t count. I wanted to experience it for myself, while hoping to God I didn’t pick up the worst tarot card out there, like they did on that episode of The Simpsons. The Death Card, I think? Thankfully, I didn’t get that. I nervously walked through Section A to Table 3 where my reader, Annie, was sitting. All I was thinking was, Please don’t say I’m going to die or become a little old cat lady when I get older. Well, once again, she didn’t say that. Okay, I’m going to stop rambling now. Sorry. Anyhow, I was asked to randomly select ten tarot cards while simultaneously thinking about what I wanted the cards to reveal. The cards affirmed that I wanted to know about my past life, future partner and career choices. I must admit that I was rather sceptical about the past life part, but really wanted to hear what she’d say so I could decide on whether it was real or just a piece of mumbo-jumbo. Following the unveiling of the cards, Annie sensed that I was a very giving person who tends to be ‘used’, both emotionally and financially. Yes, absolutely. Was this just a wild guess or was she actually channeling my soul? Funnily enough, she revealed that this stems back to my past life. In this life, I was a male whose love of his life died of natural causes at a very young age. His loyalty to his love meant that he lived his life trying to find a cure to this disease and did everything in his power to help others. This meant that he started playing a major part in the work of his farming village, which consequently meant that the wealthy nobleman began taking an interest in him. He was quite wealthy himself, but valued love more than money. The trauma in his life led to him constructing a metaphoric shell around his emotions, resulting in him focusing on the wellbeing of his neighbours instead of his own inner turmoil. Annie said that my current personality is reminiscent of my past life’s self in that I ‘give’ too much to others instead of rewarding myself for the achievements I’ve made in my life. In other words, I consider others more worthy of importance than myself, which is absolutely true. She said that in a relationship, however, a partner can take advantage of this side of you, hence her efforts in making me take note of this. This tarot card showed a woman kneeling down to a man with a pan-like object filled with gold objects. I do not want to fall into a relationship like this, so I will definitely keep this in mind. This ultimately led to the telling of my future relationships. Apparently, I will meet the ‘love of my life’ in three years. She sensed that I’m the type of person who doesn’t just ‘fall’ into a relationship, and instead, likes it to develop before getting serious. According to Annie, the tarot card revealed her “favourite type of man”; the one who communicates equally to everybody without any judgements or criticisms. The following card similarly acknowledged that he doesn’t like arguments, yet doesn’t mind a discussion once in a while. Funnily enough, I will meet him through a friend and will later find out that we went to the same university together. Moreover, he’s avid-traveller which will see us travelling to various places around the world. Annie also sensed he’ll come from a medical background, which ironically links to my past life. Oh, and he’ll appreciate the fact that we can both focus on our different careers while sharing a meaningful life together. How sweet. In terms of career, she immediately told me that within the next five years, I’ll find myself working in radio where I’ll meet some amazing people, and some idiots, too. I will have a colleague who Annie assures “absolutely adores” me, which will equate in a very strong, long-lasting friendship. This colleague/friend will be offered employment at a television station, where she convinces them to hire me, too. Therefore, my career in radio will develop into a career in television. She also assured me that I’m heading in the right direction and that my university course is the right one for me. Funnily enough, yesterday I was looking at internships at various radio stations. Coincidence? Within the next 12 months, she sensed that I’ll continue to study hard while spending more time with my friends. I will start to appreciate myself more, and there will be a guy on the scene, but he’s not the ‘one’ for me. My parents will start to realise that I’m growing up and begin to question my maturity, which is completely normal. I’ll also be saving money for something, but I’m not quite sure what for. Annie said the next year looks fantastic for me, which is exactly what I need. It’s a learning period for me where I will start to expose my true identity and stand up for what I value and believe in. I actually feel like I’ve been beginning to do that for a couple of months now, which is funny she mentioned it. She also sensed that I’m a very spiritual person in that I get ‘gut feelings’. Yes, I certainly do, and have always felt I have since I was very young. Well, she assured me that this was a very important facet of my personality, and that I must continue to make decisions based on this feeling. This has got to be one of the most amazing experiences of my life. Everything Annie brought up was so accurate, and were composed of important factors of my life which couldn’t have been guessed. This advice has released so much of my stress. I now know where my life is heading and what I can physically and emotionally do to support this path. Annie was so lovely, supportive and clear to understand. I knew she wasn’t randomly making things up, as everything she said related to my own experiences in one way or another. She acknowledged things that even I have never brought up with anybody. It was an experience I will forever cherish. It’s moments like these that the Mind Body Spirit Festival promotes. But, it doesn’t end there. This event offers a little bit of everything for males and females of all walks of life. As an eczema sufferer, I found a fantastic cream that has already worked wonders on my skin (and it was just a tester). I will let you know how that goes, but my skin feels soft already! They also had raw chocolate on offer (very delicious!) and an arrangement of various massage techniques with many offering free trials! Even if you don’t think you’re the ‘spiritual type’, I can promise you that you’ll be sure to find something that will tickle your fancy at the Mind Body Spirit Festival. On another note: thank goodness I didn’t pick up that death card. Phew! The next event will be held in Melbourne from November 15-17, 2013. Children Under the Age of 14 Receive Free Entry. Psychic Readings are $45 for a Standard Reading (25 Minutes) or $90 for an Extended Reading (50 Minutes). Save time and money by pre-purchasing General Admission tickets online for $18. For more information, visit the MBS website, or inquire at (03) 9276 5555. Thank you so much for your kind words, Tusk. I hope you do get the chance to visit Australia, one day! There’s so much to do and so many places to visit! Thanks again! Kind Regards, Jenna.